On April 9th 1967, the first Boeing 737 aircraft departed from Boeing Field, Seattle, Washington marking the start of an era for Boeing in producing one of the world’s best-selling jetliner in the history of aviation. 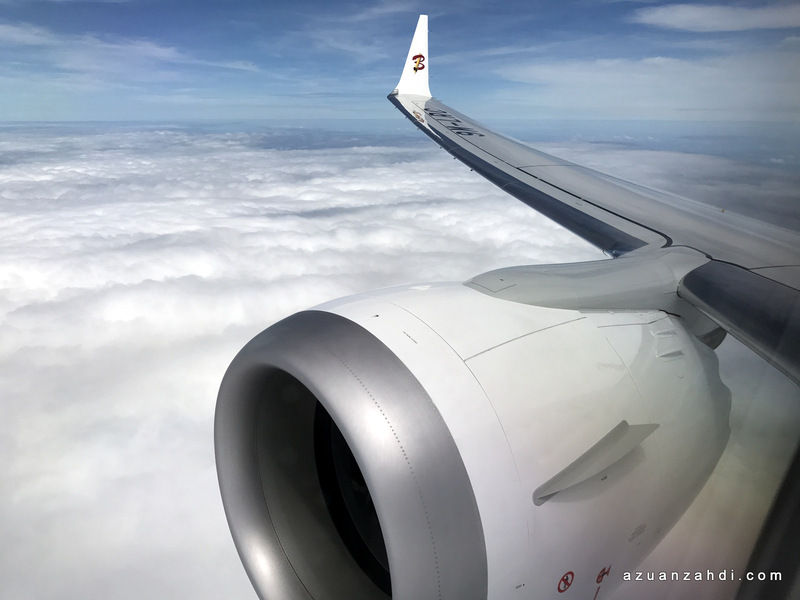 Since this maiden flight, the Boeing 737 has proven to be an efficient workhorse of commercial aviation connecting people from all corners of the World with around 9,486 aircraft of this type manufactured. 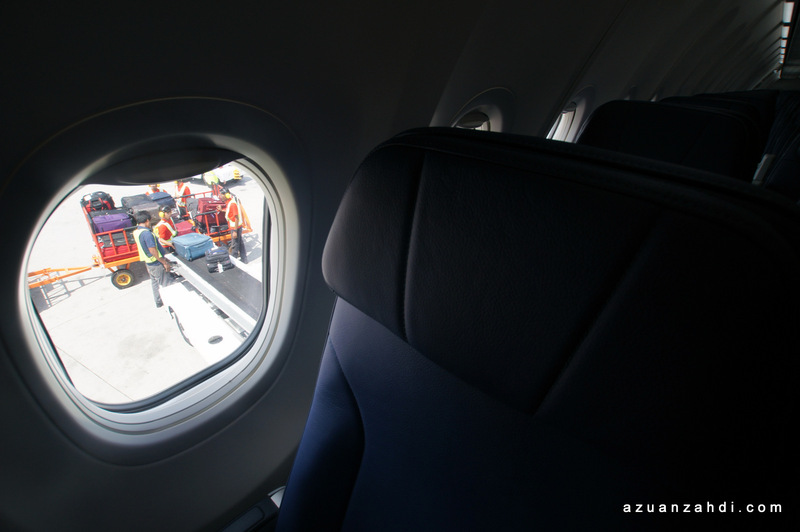 50 years later and after a few rounds of updates to the Boeing 737 series, the aircraft continues to remain relevant in the ever demanding airline industry. 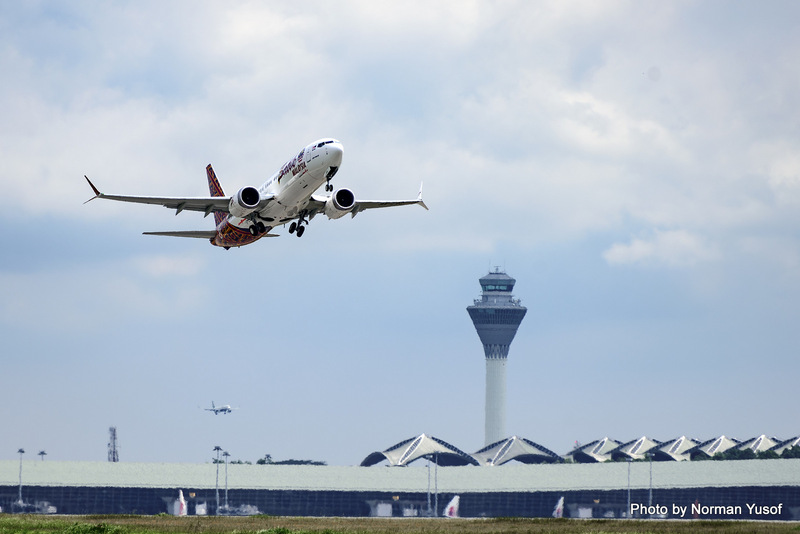 The drive to produce an aircraft that is cost effective for airlines, friendlier to the environment and a joyful experience for the passengers call for another round of update. 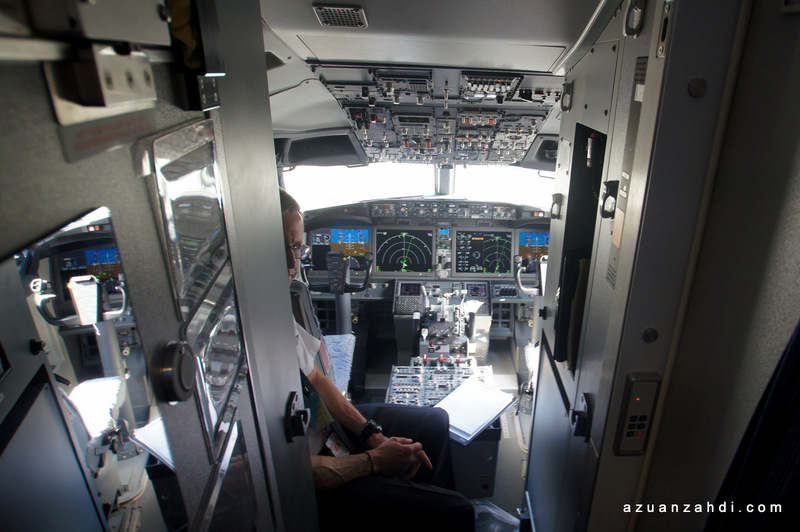 This is where the “737 MAX” comes into the picture. The MAX family is Boeing’s latest update to its popular 737 with the focus of the updates mainly on brand new engines, sexier and better aerodynamic wings that feature an “Advanced Technology Winglet”, a better cockpit experience for the tech crew and a few other minor enhancements. 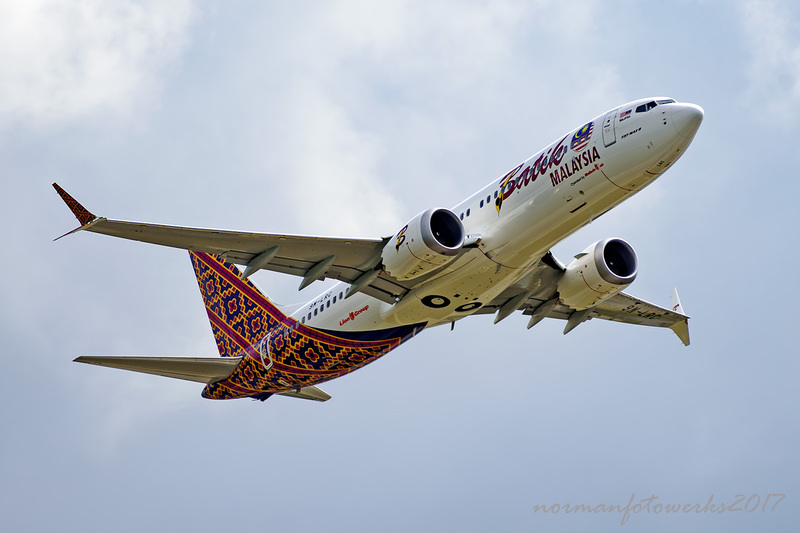 It is definitely a cool plane and you can read more about it here, but what I find equally interesting is that the first commercial flight on a 737 MAX 8 in the world is actually by a “9M-“ registered aircraft. 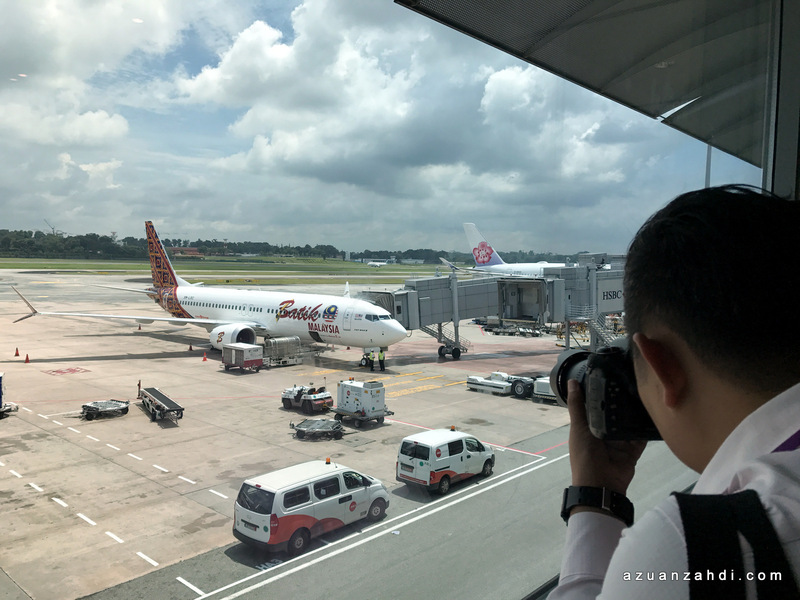 Yes, a Malaysian operator, Malindo Air is the first airline in the world to put the aircraft into passenger service and I’m one of the first to fly on it! It is not every day that aviation geeks like me have the chance to experience something exciting like being the “first to fly” on a new aircraft variant, so I was really looking forward for 22nd May 2017. 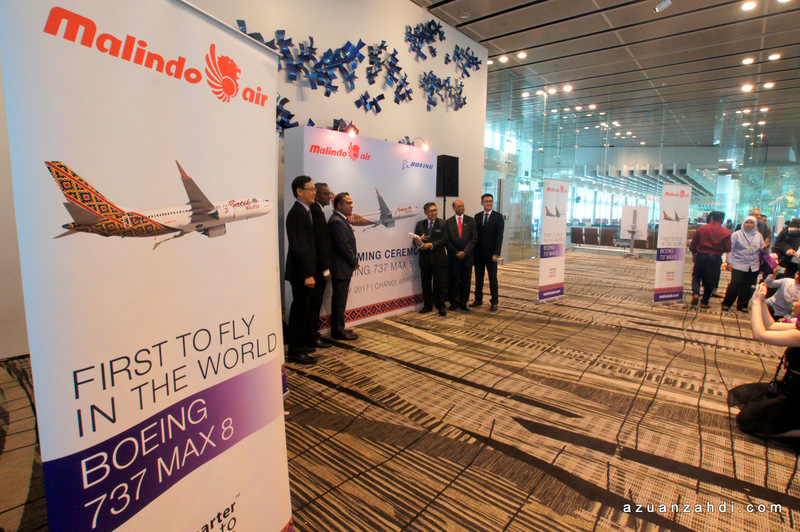 The day Malindo operates the first commercial Boeing 737 MAX 8 flight in the world. 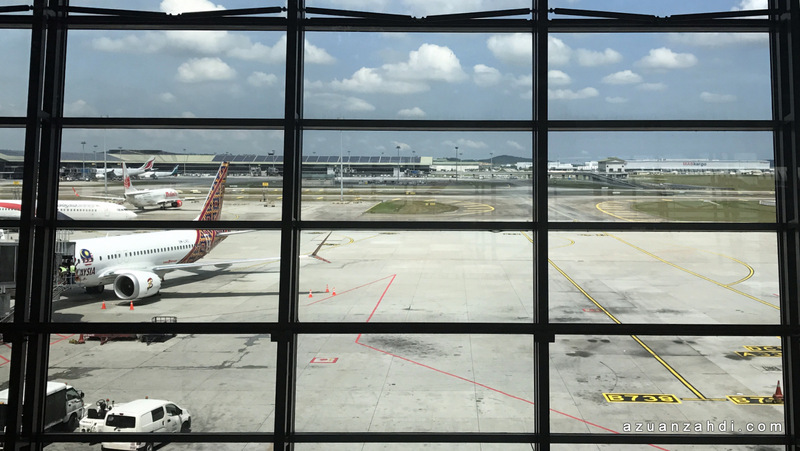 OD 803 Kuala Lumpur – Singapore. 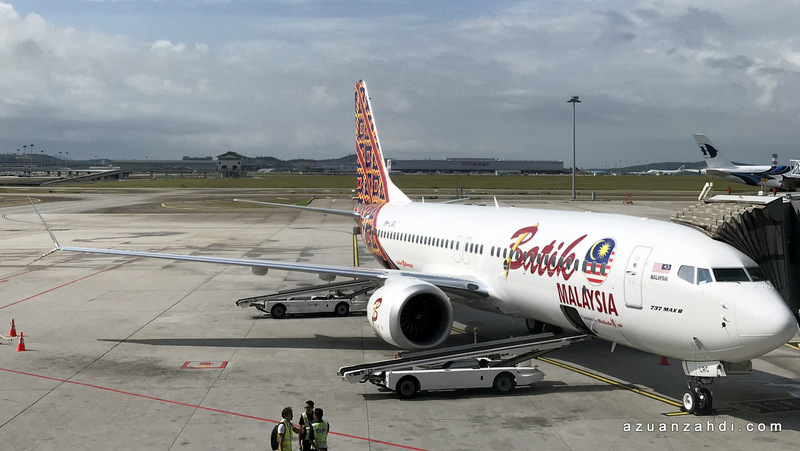 For an airline that is only 4-years old, this is an interesting milestone for Malindo. Few of the ground staff that I spoke to was excited and proud of their airline being the world’s first to operate a 737 MAX. Check-in was fast and I managed to get seats that I requested for, aisle seat outbound to Singapore and window seat inbound to KL. 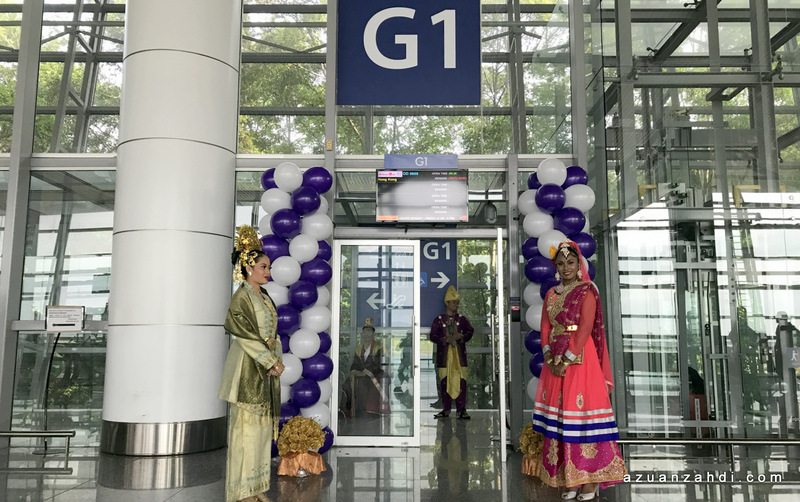 A festive ambiance celebrating this historic day for the airline not only can be seen at Malindo’s check-in area but also all the way to the event area at the gate. A series of speeches by the VIPs namely Mr Chandran Rama Muthy CEO of Malindo, Dr Dinesh A. Keskar, SVP Asia Pacific & India Sales, Boeing Commercial Airplanes and Dato’ Sri Azharuddin, DG of DCA has one message in common – the arrival of Boeing 737 MAX 8 aircraft brings positive impact to the industry with the aircraft manufacture, airlines, regulator, the environment and passengers benefiting from the advancement of technology featured on this aircraft. The superstar of the day was revealed right after the launch gimmick, drawing lots of excitement from the audience. 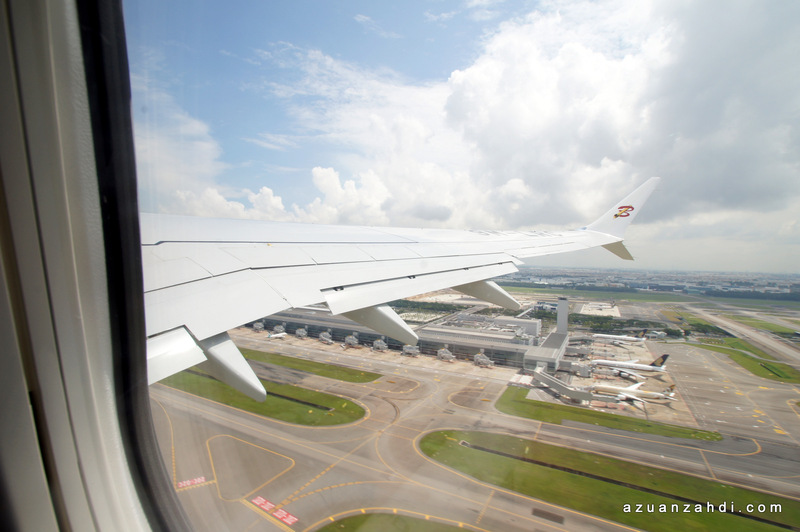 Water Cannon Salute from Malaysia Airports, the new home for this beautiful bird. 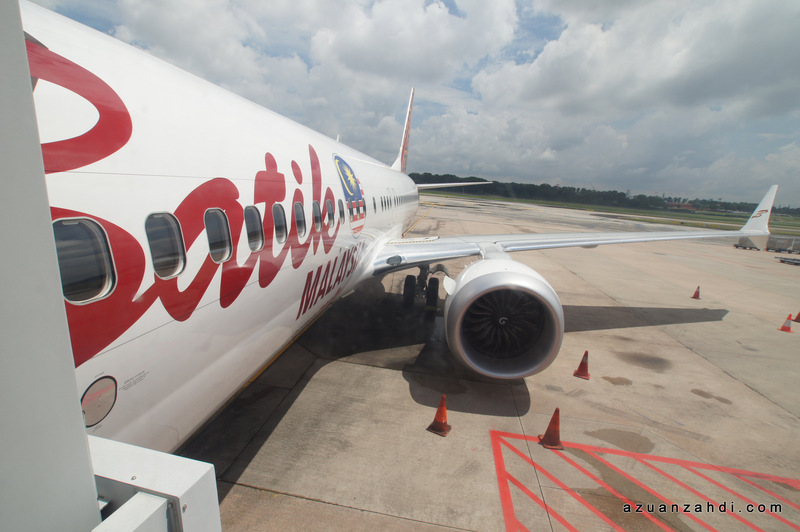 Also can be seen in the above photo is the distinctive double winglet of 737 MAX 8, one of the easiest way to spot this aircraft variant. Another unique feature of 737 MAX is the CFM LEAP-1B engine with that unique chevrons at the rear of the engine casing. 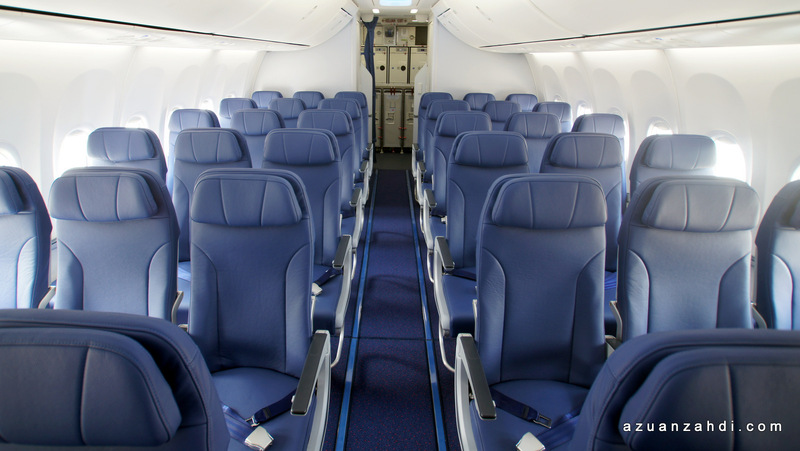 Together, the enhancements on this plane delivers 8% lower operating costs than its main competitor. All about that wings and engines! 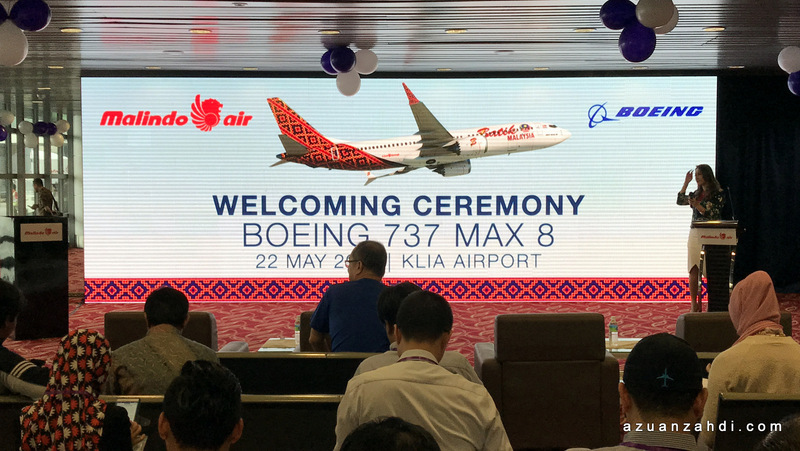 By the way, in case you are wondering, Malindo Air is in the midst of a rebranding exercise and will be known as Batik Air Malaysia later part of the year. With all the formalities done, boarding for flight OD 803 from Kuala Lumpur to Singapore started. 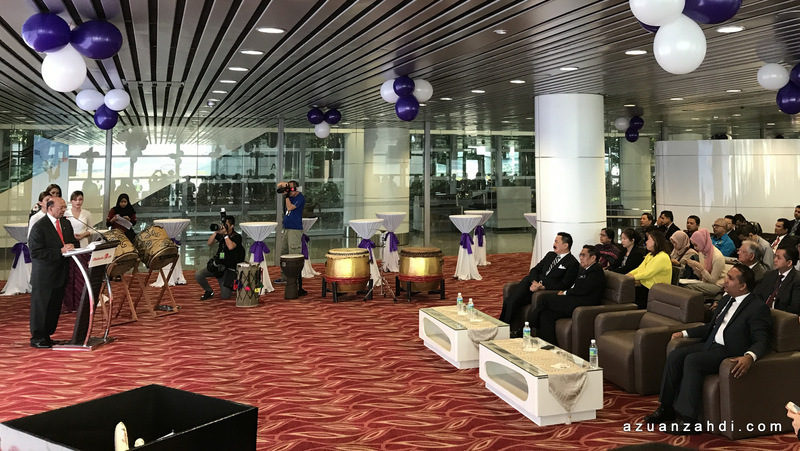 Media and guests of this inaugural flight were given priority to board the aircraft first. Group photo with some of the airline’s staff! 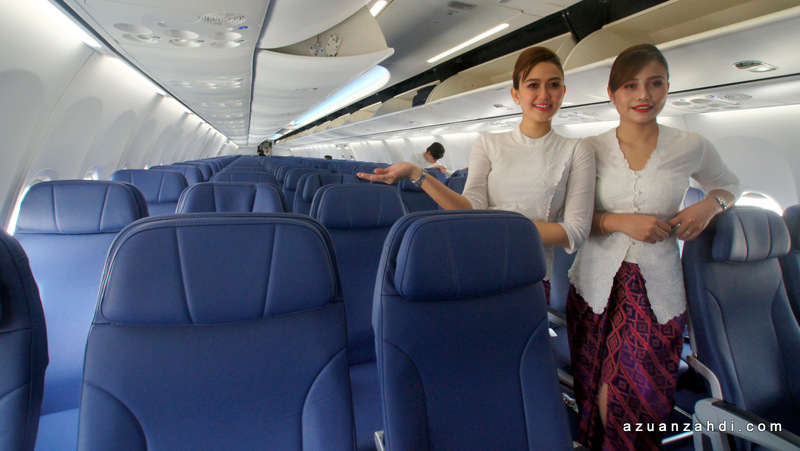 Upon stepping into the plane, that unique “bau kedai” or “factory smell” kicks in which is nice. A warm welcome by the team of 5 cabin crew. 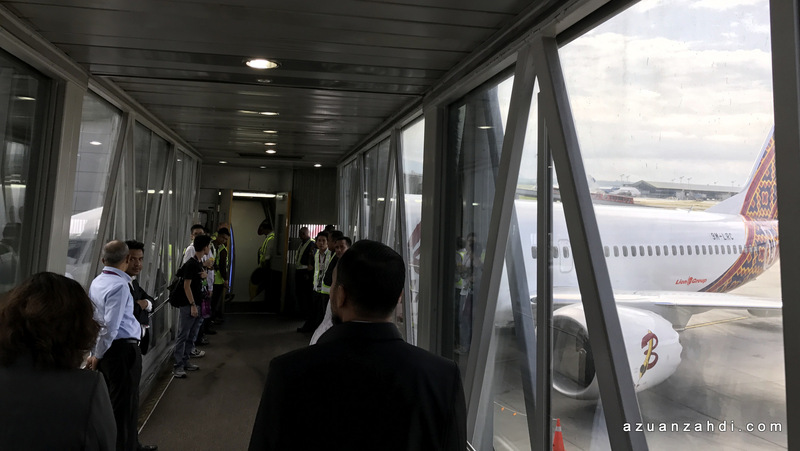 Frequent fliers with Malindo might notice a few obvious differences between the cabins of 737 MAX 8 vs other Malindo Boeing 737800/900ER aircraft. 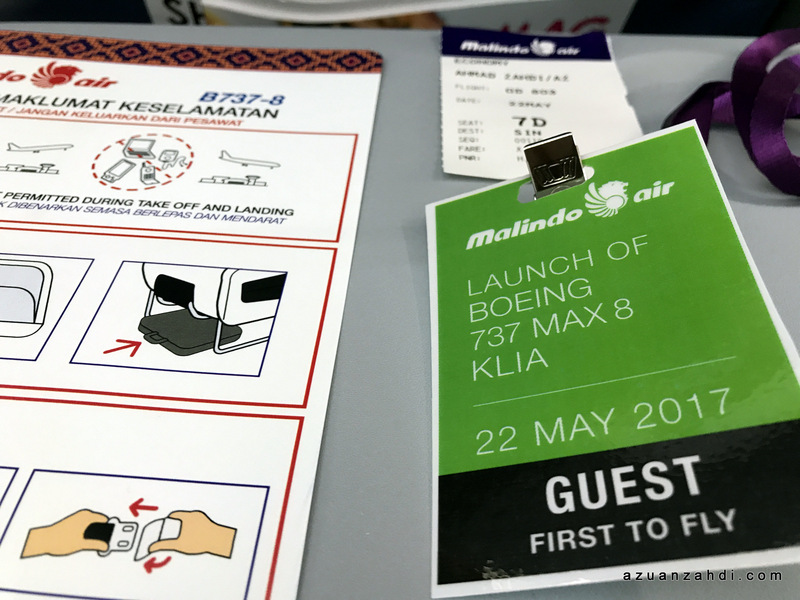 There is no business class on Malindo’s 737 MAX 8. This aircraft will be deployed to routes where business class seats are not hot selling items. 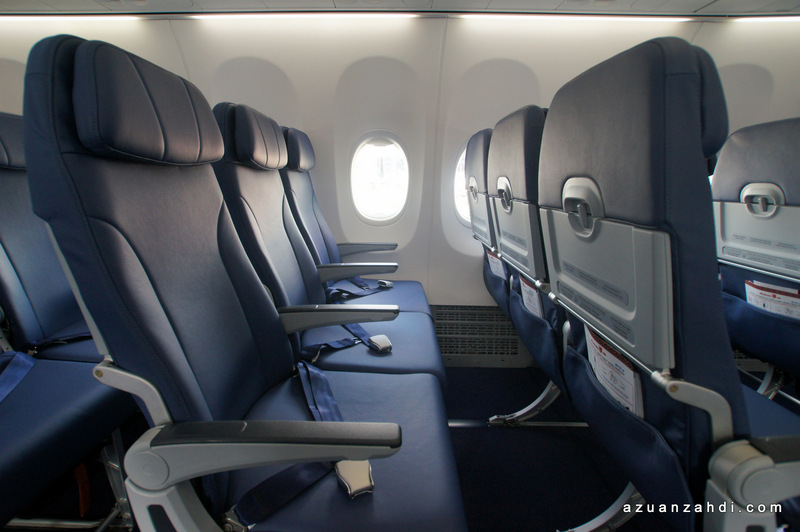 A single cabin allows the airline to add more economy class seats and carry more passengers on high density mid-range routes like Kathmandu, Dhaka and Lahore. Also a notable difference is the seat colour. It is blue instead of the usual red and brown. Good news is, this new seat is equally if not more comfortable. It is leather and comes with head rest support! 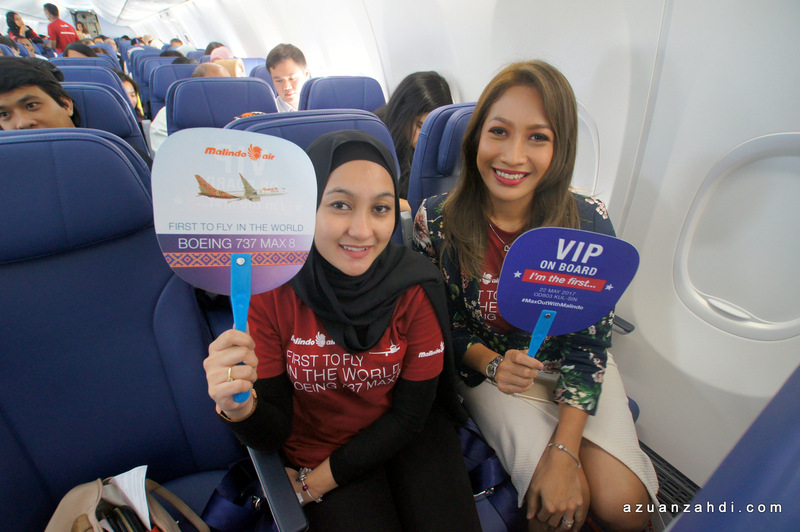 The Extra Legroom Malindo is famous for is still there. 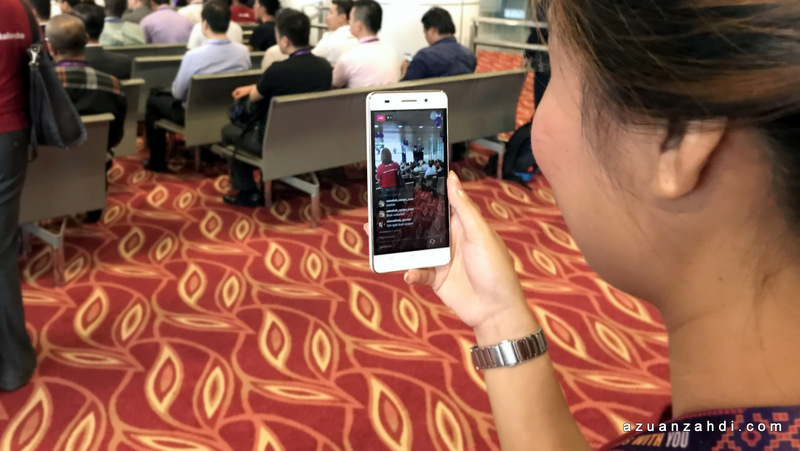 It has gone down from 32″ to 31″ but this is still better than other competitors in Malaysia. And yes unlike other Malindo’s Boeing 737 planes, there are no individual in-flight entertainment screens on this particular plane. 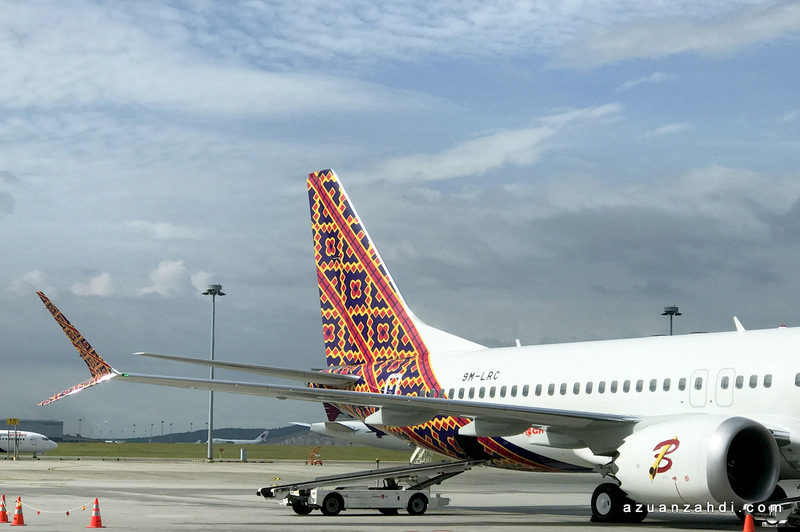 AzuanZahdi.com is in the midst of clarifying this with the airline on whether this is something temporary or will be the same for all the 737 MAX 8 operated by Malindo. Memorabilia. No I did not remove the safety card from the plane. A sneak peek at the cockpit. 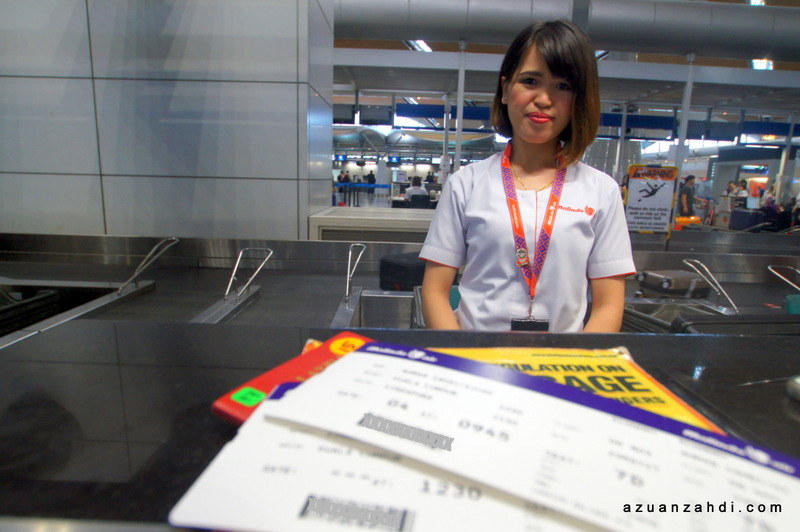 With bags loaded and passengers boarded, OD 803 operated by 9M-LRC push-backed from gate G4. The sound of engines being started got the aviation geeks on-board excited. It is music to our ears. 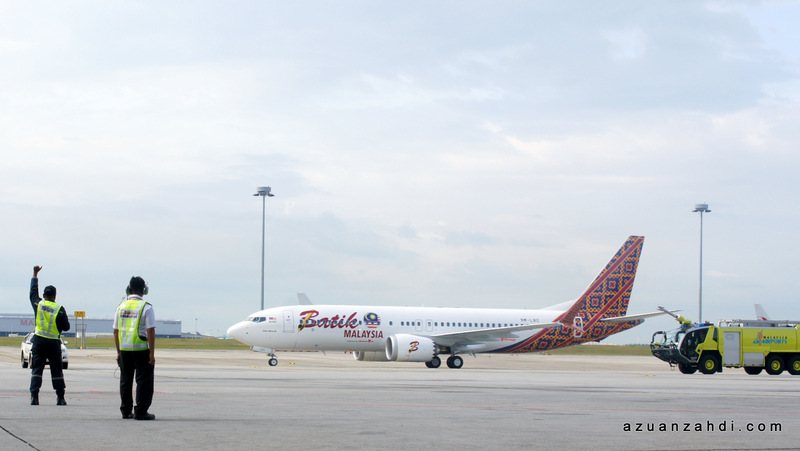 After a short taxi, the aircraft piloted by Capt Badrul Hisham and Capt Ajmain departed from runway 14R. Seconds after take-off there was a lot of excitement in the cabin with passengers giving round of applause and some cheering away while others taking photos of this historic moment. The first commercial flight for Boeing 737 MAX 8 has officially taken off. This moment is also captured from outside. Special thanks to Tn Hj. Norman Yusof for these lovely photos. I remember reading during the development stage that the 737 MAX is designed to be 40% quieter than the Next-Generation 737. I feel that it is quieter during take-off roll and cruise but I’m not sure how much quieter. Random shots in-flight. Arrived in Changi slightly behind schedule but with lots of happy passengers judging from the sound of applause upon touch down. 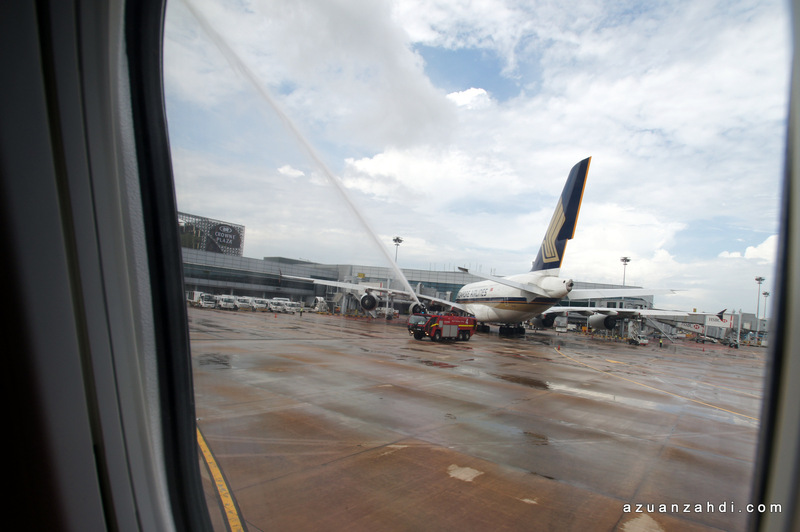 A grand welcome by Changi Airport – a water cannon salute! 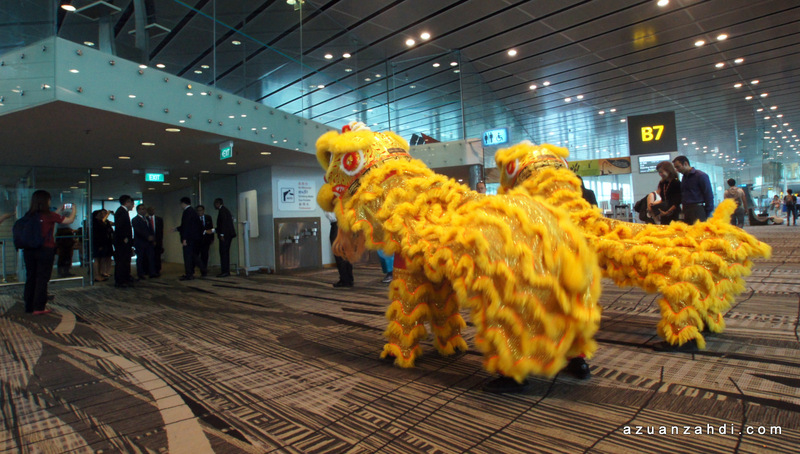 The celebration continues inside Changi’s terminal with a welcoming performance and cake cutting ceremony. The return flight was uneventful but with slightly lesser passengers, we were able to roam freely to take more photos of this beautiful bird. 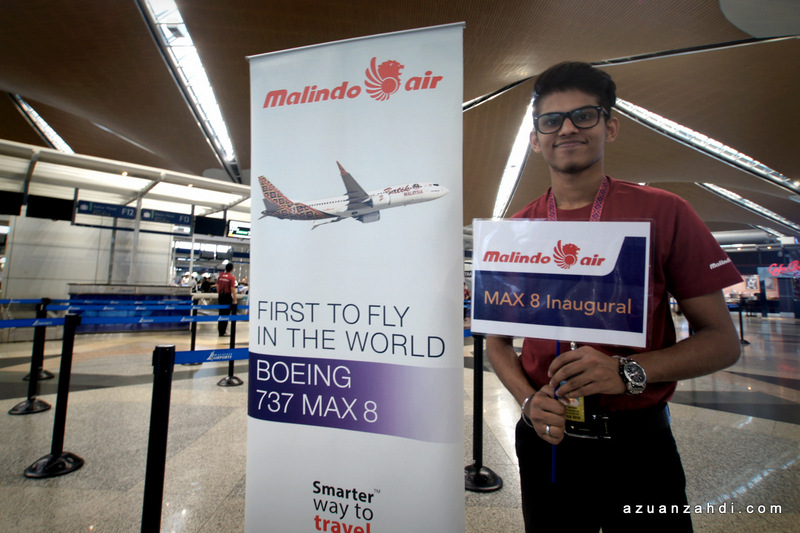 A special thanks to Malindo Air for the invitation and congratulations on this exciting milestone being the first airline in the world to operate a Boeing 737 MAX 8 commercial flight! 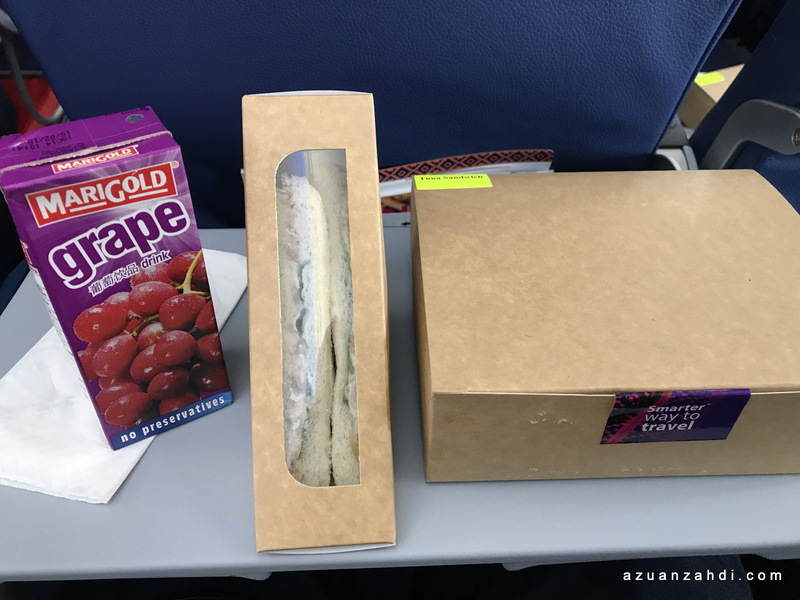 For more of my aviation stories, click here! ah…now i recall why my friend’s flight to nepal recently tade IFE etc. hehe. they are flyin this bird rupanya.